Yesterday, I wrote that the 18-point Liberal ON lead in the EKOS poll was "almost certainly too large." 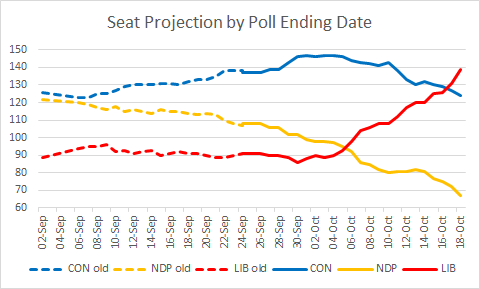 Well, today, Nanos has the Liberals up by almost 17 points there, and an Innovative poll conducted late last week had the Liberals up by 20 points in Ontario! This explains the majority chatter in some pollsters' tweets - and from Justin Trudeau himself. This also explains why Trudeau asked for a majority in French: even if he were to win 90 seats in Ontario, he would still need a breakthrough in Québec, and no poll has had him higher than 31% there. The blockbuster ON numbers boost the Liberal national lead to 6.7 and 8 points in these polls. 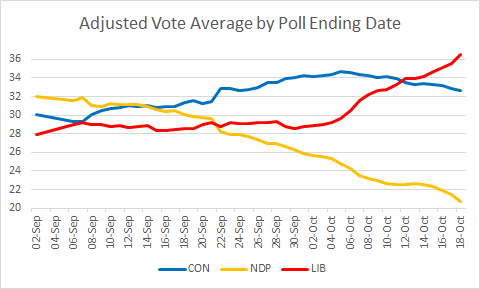 The unadjusted polling average retains a healthy amount of skepticism; it has the Liberals up by 3.7 points nationally, and by 10.5 points in ON. With the turnout adjustment, it's 1.0 and 7.3. - The City of Toronto adjustment (CON +5, LIB -5) is maintained. - To balance things out, it's now CON -1 and LIB +1 in the 905, and CON -1.5 and LIB +1.5 in Ontario outside the GTA and Northern Ontario. The other modeling change I'm making was planned all along: since there will be an avalanche of big polls in the coming days, there will be less need to include older polls to decrease statistical uncertainty. They will therefore be discounted more quickly. The 5 most recent polling days will continue to retain full weight. Up until yesterday, each earlier polling day had its weight reduced by 1/10, so that 9 days were counted at partial weight, for a total of 14 days with weight. Starting today, the number of days with partial weight will be reduced by 1 on the first update of each day. Thus, today's projection is based on 13 days of polling, etc. Sunday's morning projection will be based on 10 days of polling, and the final projection will be based on the last 9 days of polls (i.e. days 6-9, counting backwards, will be weighted at 0.8, 0.6, 0.4 and 0.2). On these numbers, the Liberals have a 40% chance of being in the lead. These numbers imply a 75% chance of the Liberals being ahead. 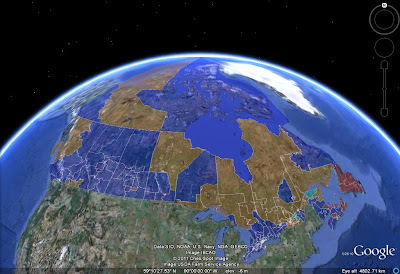 Do you happen to know if there is an Angus Reid poll coming up soon ? Same with Mainstreet. They were the last 2, I believe with conservatives close to the liberals so just curious on if all pollsters are seeing a similar trend. Also, very interesting about the Ekos polling is a rise of the NDP in Quebec. What i find interesting about very recent Ekos results is the 25-30% support of the 18-34 age group for the conservatives. I'm wondering if that is suspect. I imagine that all major pollsters will want to have a final say. Both EKOS and Nanos show the NDP recovering in QC, but Nanos shows a very slight recovery (well within the MoE) while EKOS used to have the NDP lower in QC than Nanos and now has it higher. It'll be interesting if others also put the NDP in the low 30s, or instead have it in the mid 20s (like Ipsos and Forum) - this could determine whether the Bloc regains official party status.